Daikon Stilk chandelier features a duo of illuminated branches. Each branch is connected using swivel mounts. The swivel feature allows for both horizontal and vertical movement and the chandelier configuration to be determined on-site. Meticulously crafted by hand in our studio. Two (2) fully adjustable branches Measures: Branch Lengths: 46in. and 54 in. Weight: 18 lbs. (Also available in custom sizes.) Features: Deluxe brass collars and end caps. These are handmade metal accents at the bulb and end of tubes. End caps are offered solid or with a circular opening. Impacts the visual weight of the fixture (i.e., gives the illusion that the tube is solid). Provides visual contrast. Material options: steel (Please see alternate listing for brass or stainless.) Finish options: industrial clear, onyx black wax, satin black, matte white. Mounting details: hangs from four stainless steel aircraft cables. This Daikon uses four T10(T30) bulbs which are not included. Several styles of bulbs are available for purchase. 30w incandescent bulbs $6 each. LED vintage filament bulbs $26 each. Please note: For indoor use only. Never use bulbs rated above 40w, bulbs over 40w are much too bright to be exposed and create excessive heat. 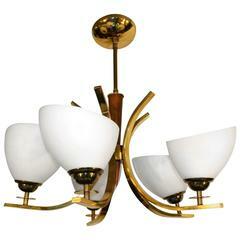 Daikon lights are made using UL listed components however the fixture itself is not UL listed. Daikon Studio is situated at the intersection of art and mechanics. In our Chester County studio, we design and build lights and objects that balance aesthetic desires with experiential demands. Our designs blend elements found in ancient sacred spaces like temples and stupas with the visual and material strength of steel and brass. Created with our custom dynamic hardware, Daikon lights uniquely adapt to the preferences of each client and to the specifics of each space. Body in gold plated brass. Shades' exteriors in lacquered glass with brass accents, interiors lacquered in metallic gold. Measures: Diameter 90 cm 35.4 " Height 70 cm 27.6 ". 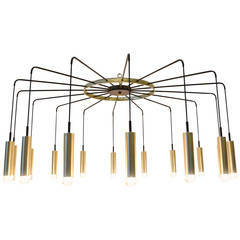 Bamboo reed chandelier with brass details. (Two are in stock).